I’m still groggy from the short sleep I managed to get on the flight and take a long stretch. My feet are swollen as I squeeze into my hiking boots while looking out the window. Below me are miles and miles of flat dry landscape. Its the Steppe desert, and I instantly recall our Geography class all those years ago with Mr Byrne telling us about the Steppe ecoregions and the special type of grasses and savannas that grow there, capable of surviving months of drought. I’m loving it. And I love that I’m actually here, now, in this remote part of the world, finally seeing it for myself. I can’t wait to land to check it all out. I’m disturbed by another gentle poke from the lady beside me. She hasn’t spoken throughout the flight, and I had noticed earlier on that she had seemed nervous. She looks around Mam’s age, somewhere in her 70’s. She’s someone who lives in a world similar to my home town- suburban, safe, secure. I was at first keeping an eye on her, but she seemed to want to be kept alone, which if I’m honest, kind of suited me too. 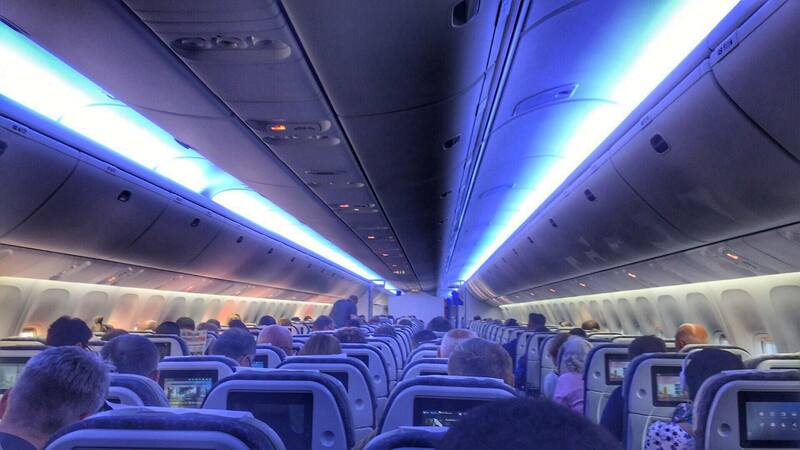 Whenever you strike up conversation with strangers on a flight, its kind of a risk isn’t it? I mean it could go really well and you meet the biggest love of your life, but you could also meet a ‘monologuer’- those people who never know when to shut up- think Dell Griffiths of the movie ‘Planes, Trains & Automobiles’. I have to admit that I’ve met the latter way more than the former, so I pop on the headphones, smile at my neighbour and we get on with the flight in an agreed silence. We were given this small immigration form in the first few minutes of boarding, and she has it in her hand now. It is without doubt the smallest form that I have ever had to fill in, kind of around the size of a post-it note. The font is so tiny in the instructions part, its hard to decipher what they want us to complete. She asks me a question, pointing at the form. I think shes speaking Kazak which is surprising to me, given the way she is dressed. I look sheepishly at her and give her a ‘Sorry I don’t speak Kazak’ kind of look. I think I’ve annoyed her, and she tries to continue on her own. This might be my first ever Irish-Kazak interaction, I have to make more effort than this. So to make amends I sort of hover over her. She is looking at the form blankly and I feel obliged to help her in some way. I wrack my brains wondering what the problem is. ‘May be she might need me to transcribe for her’, I think. ‘May be she can’t write?’ I gesture the universal writing sign (you know the one, where you write in the air, kind of the same gesture you use to ask for the bill?). But she shakes her head looking at me as if I’m mad. I turn away, looking back at the view below. She mutters something to herself, probably commenting on what an idiot I am! I half-hear it and recognise some of the words. Its german! She’s speaking german! I can help her! So I have a go with my ‘fluent’ language skills: ‘Sie sind Deutsch?’. She looks up at me relieved and pushes the form under me. I get out my glasses and see that this unbelievably tiny form is written in Kazak, Russian and English. No German anywhere. Aha! I have it! So I make an attempt to translate the different sections for her, and we make progress. I explain that she needs to write down the purpose of her visit. She says repeatedly ‘Meine schwester. Meine schwester’ – my sister. Her sister. She’s travelling to Astana to see her sister! Imagine that. Her sister at some stage in her life, emigrated to Kazakstan. I wonder to myself ‘When did her sister do that, and why? Was it years ago, and has she seen her sister since she left Germany?’ But I don’t dare ask. This woman isn’t down for chitter chatter and if I’m not careful, I could be the Dell Griffiths of this flight. We continue with the form. We write down the address of her sister. And then we’re done. Sort of. There are one or two questions that I can’t figure out. She tuts! And that’s it. She puts the form away and returns to looking at the flight path on the screen in front of her. And I return to the window. But I keep looking at her out of the corner of my eye. I’m intrigued by her. I imagine her sister again, living in Kazakstan and their reunion at the airport. And I admire her. A lot. Here’s a woman, who seems similar in age to Mam, who probably lives in a suburban part of Germany and now she has travelled on her own, all the way to Kazakstan to see her sister. I smile at her. ‘Go you!’, I say to myself, ‘I hope that I’m as brave as she is, when I get older’. I meet up with Steffen, Stefan, Andreas and Vasily in the concourse. Weird. In the short time that we’ve been apart, something has changed between us. We’re a team now. Already. We’re all giddy, chatting away together. No more ‘concrete’ chats happening, thankfully. Now we’re noticing together this new environment, enjoying the sensory overload. ‘Look at the Kazak police uniform!’ Vasily says to me, ‘Do you think I could get them to give me one of their oversized helmets?’. I giggle back and understand exactly what he means. Our tiny forms get stamped at passport control by another uniformed policeman in the large helmet. We’re told to keep them safe. 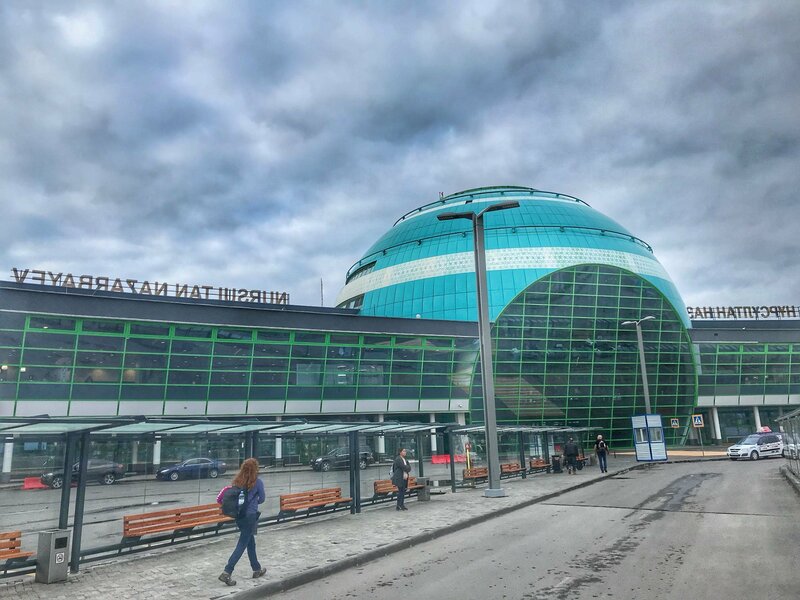 And now we’re officially in Kazakstan! Andreas shepherds us all towards the very small Bureau de Change. We’re wandering around drinking it all in- the buildings, the people, the shops around us. Vasily is already snapping away on his camera. I exchange my €200 into €150 in Russian roubles and €50 in to Kazak Tenge. I hope that its enough. We walk outside the airport to access Terminal 2. It’s freezing outside, similar to a spring morning back home. ‘Maybe the temperatures are not going to be in their 30’s after all’, Steffen says. ‘God I hope not’, I say. ‘I have no warm clothes with me’. I worry that after all those failed attempts to pack the night before that I’ve brought all the wrong clothes. I have brought light, summer clothes, as instructed by Andreas. Not even a heavy sweater. I wonder if I’ll be able to buy clothes in Baikonur. And then I worry about money again for an instant. The level of voices increase as we descend the stairs to the boarding gate. And suddenly it feels like we’re back in Europe. Everyone here looks familiar, lots of English and German being spoken around me, the occasional big yelp of laughter bursts above the excited voices around me. 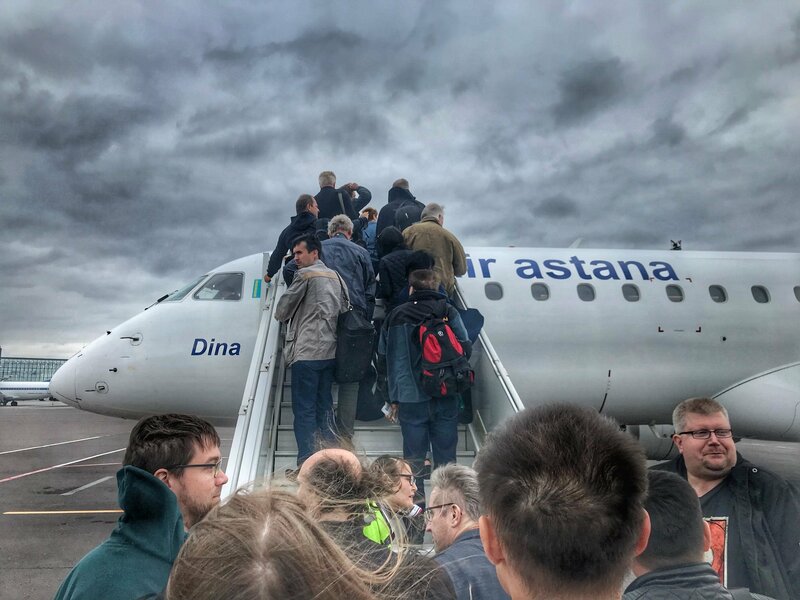 We’re all boarding the third and final flight to Kryzlorda airport. One step closer to our final destination of Baikonur. And it strikes me that all of us are here for the launch. There’s a kinship between us all. This guy called Peter approaches me, he knows me from twitter. I don’t know him but appreciate that he’s reached out to me. And we exchange a few sentences together. ‘Everyone is here’ Andreas says. People all seem to know each other, lots of hand shakes and hugs. He disappears across the hall, and I follow him with my eyes. Then I see Galina! The same guide that I had on the Zero G flight. I wave over at her but she cant see me. She’s surrounded by a big group of people. ‘Those are probably the Slovenians’ who are joining us on the trip’, I think. Galina is lovely. We got on so well in Star City last year and she was the very first person I met in Russia. She met me off the plane. 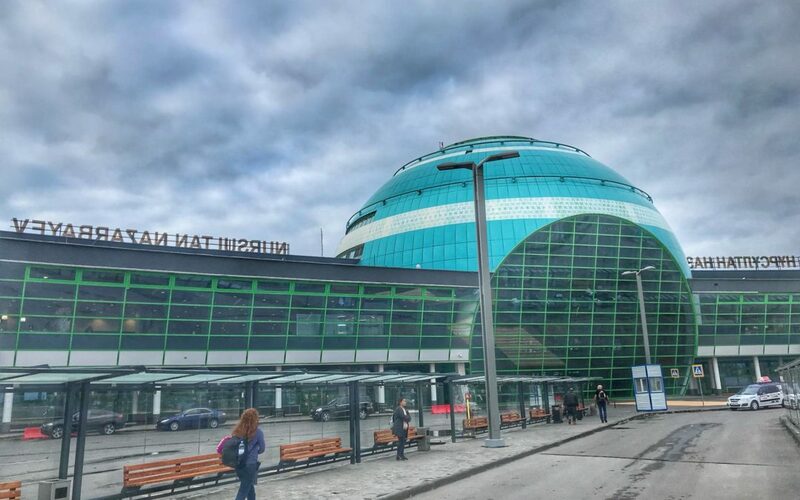 I remember being very nervous entering Russia, especially going through passport control. And I wasn’t sure how safe it would be to travel solo to Moscow, so it was a relief to see her. It felt like we immediately got along and I really enjoyed her company. I’m looking forward to seeing her again and spending time together in Baikonur. The gate opens and people make a hap hazard queue towards the bus to take us to our final flight of the journey. There’s familiarity in the group of us. I feel part of it already. Sort of. Or maybe its because we all share the same passion for space. 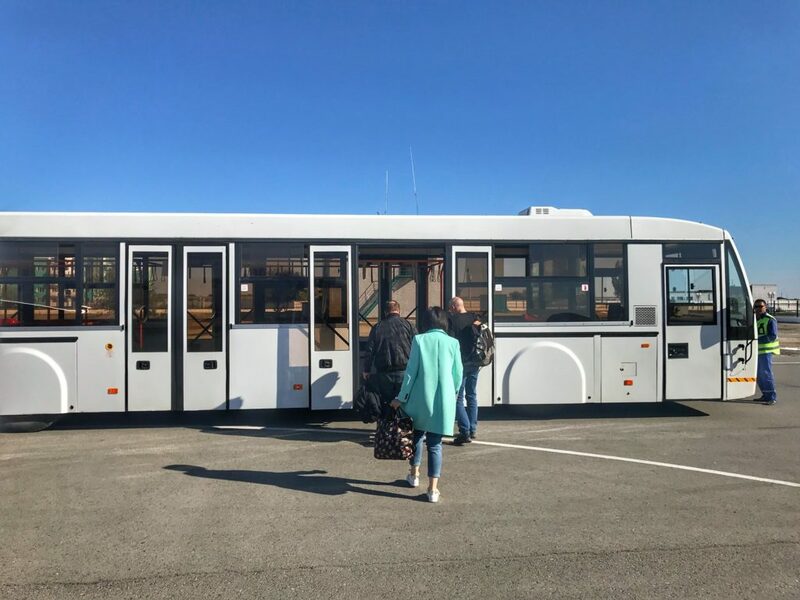 So there is no pushing and shoving, people are politely making room for everyone on the bus heading out to the final flight, headed to Kryzlorda airport. The bus to the plane is crammed, mostly men, may be 7 or 8 other women. They’re a lot different than me, I notice. A lot more outdoorsy types. A lot of them are wearing space-themed t-shirts or jackets. And warm sweaters, and I think again that I’ve brought the wrong clothes. One woman’s voice is booming over the rest of us. I meet her later in the toilets when we land at Kryzlorda airport. I know by her that she’s done this many times before, shouting across to different people, sharing jokes that make absolutely no sense to me. But everyone other that Steffen, Stefan and I, who are all standing together, find what she says hilarious. Also the lady beside me who looks totally out of place on this largely European bus. We smile over the joke that we didn’t understand. ‘Excuse me’, she asks, ‘do you mind if I ask you why you are here?’. ‘We’re all here for a rocket launch in Baikonur’, I tell her. I notice people looking at me. ‘God, I hope that I said that correctly’, I think to myself. ‘Ah’ she says, ‘I understand now. I have never seen so many foreign people in one place before. Enjoy your time in Kazakstan’. I say thank you and am about to launch into asking her about her life here when the bus doors open and we are already at the plane. I never see her again. I grab a quick picture before boarding. We had to book business class because there were no economy seats left. They’re very comfy and I’m looking forward to a bit of pampering during the short 90 mins flight. I see Galina climbing the stairs towards the plane. I jump up from my seat, to give her a big hug as she walks by. I can tell by her reaction, that it was probably a bit too familiar, and I’m embarrassed. ‘Just sit down, you idiot’, I think to myself. ‘You’ll have plenty of time to re-connect with her over the next few days’. 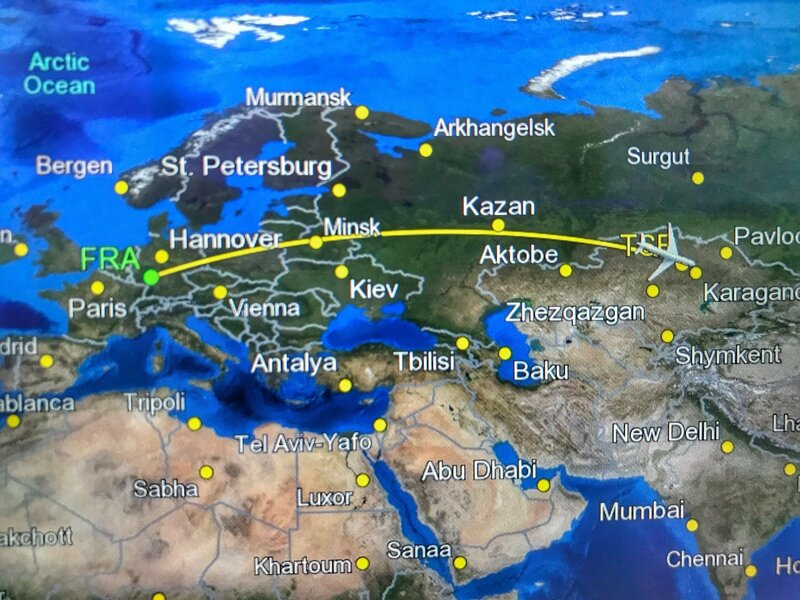 The plane takes off and next time we land I’ll be just 3 hours away from Baikonur.